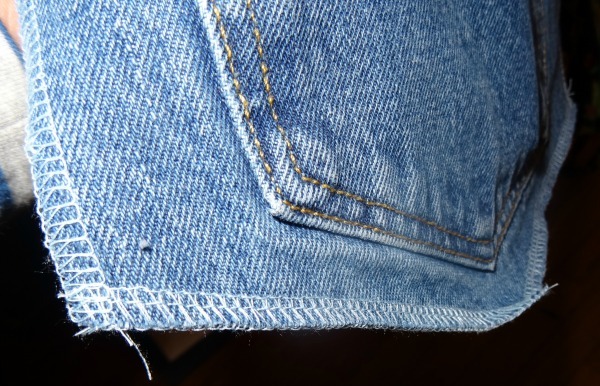 For reasons that he cannot remember, my husband bought a pair of jeans with a button fly. He wore them a couple of times and then they just took up space. I decided I could make something out of them and sure enough I did. Read how to upcycle an old pair of jeans into a sewing machine caddy. I decided to show you the finished project first to get you enthused. Doesn't it look fantastic? Thanks, I think so, also. 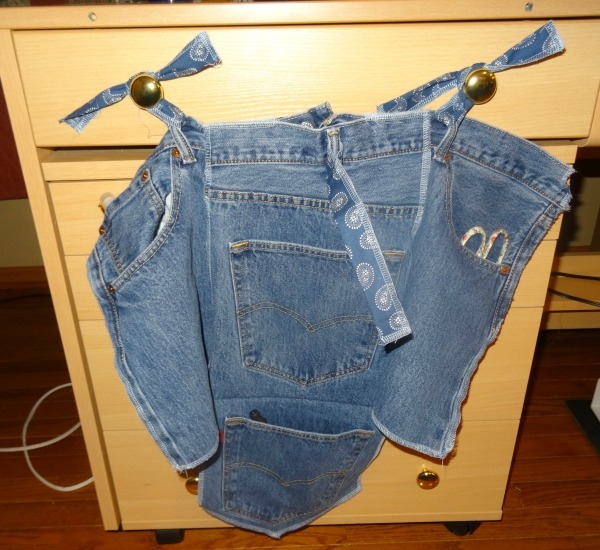 You can see that I saved the top of the jeans complete with pockets. 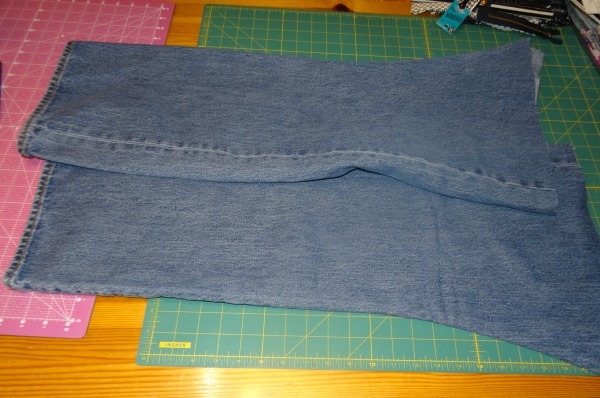 I also salvaged the two pockets from the back side. I sewed them together. Done! Fine, more complete instructions follow. First thing I did was cut off the legs. Where? Good question. I cut them off exactly where the inside pockets stopped. I did not want the inside pockets to stick out under the caddy. It might look long but it doesn't even bother me at all. I barely remember it is there while I am sewing. 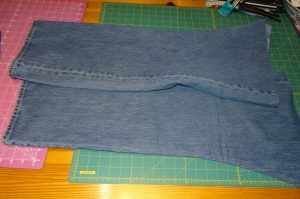 Denim is very thick fabric so I did not want to to fold back the edges and hem them. 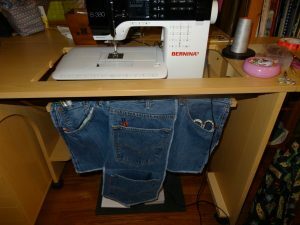 I decided to use my serger. I serged all around, every raw edge. 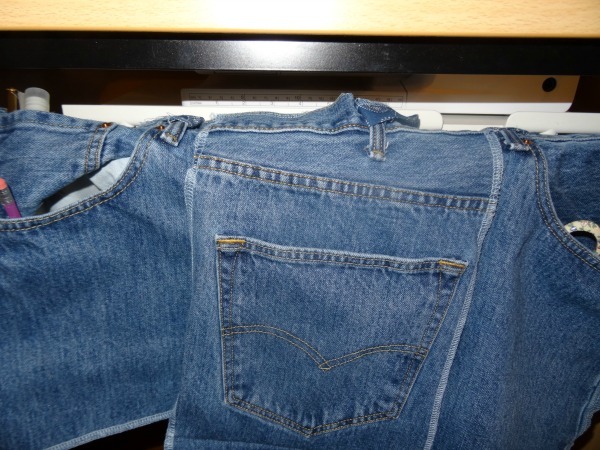 I did the same thing to the two pocket pieces from the back. I sewed the top of the one to the bottom of the other. I wanted all the pockets for the caddy and this way, I got them. 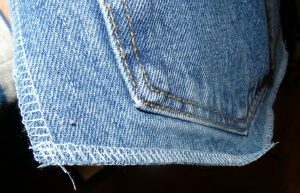 I stitched the two pocket unit to the top of the front pocket section. I did not button up the fly. It is open so the whole pocket could fit. 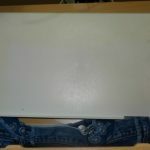 See the belt loops? I decided I wanted to use those to make my caddy a bit more versatile. 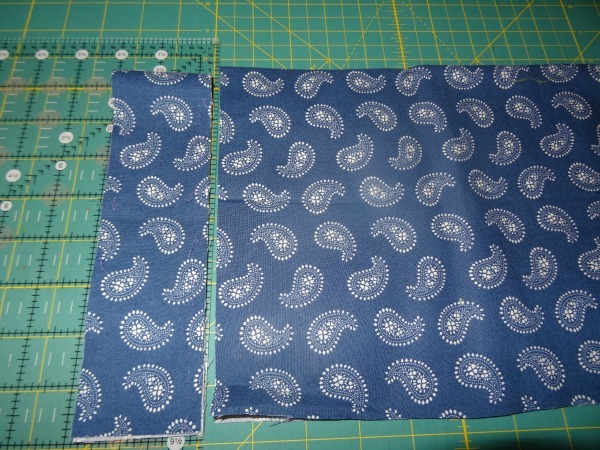 I cut three 3 inch strips of a bandanna like fabric. 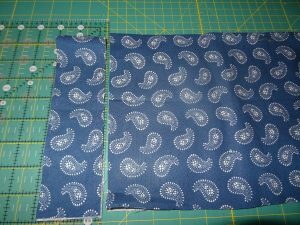 I went with my serger theme and just stitched them closed on my serger. I hooked the strips through the loops and sewed them closed on there. Why did I do this? At the time I was wanting to make the caddy portable. 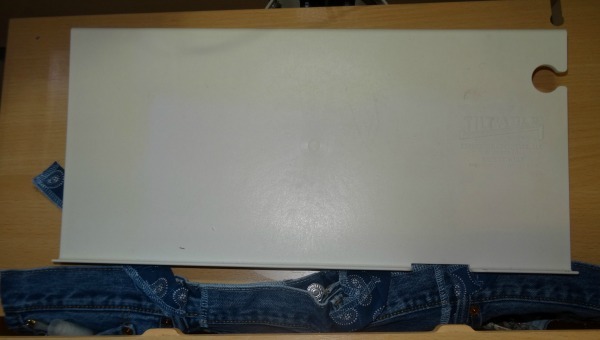 To use it with my sewing machine, I just tucked it under the edge of the slanted table I keep it on. But I can also take it with me and tie it onto things now. I tried it out with my sewing drawer and it fit perfectly. I have an extra strip because you never know where I might take it. I have a seam ripper in there along with a pair of shears. I packed a cleaning brush, a chap-stick and a stiletto as well. If I go to a workshop, I would pack even more and then just roll it up. I love it. My husband now has two pairs of jeans that are worn out. Hmmm, what else can I make? Tell me your ideas. 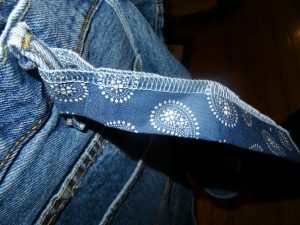 I have written before about upcycling clothing. Check this one out.